Today, 4-year-old Eli stopped by with his mom, grandparents and baby sister to drop off food that he purchased with his own allowance. With his mom matching his allowance, Eli was able to help pick out $12 worth of food to donate. 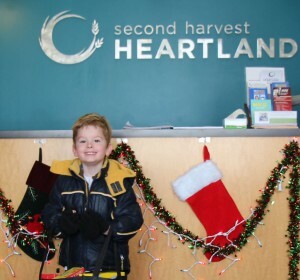 While touring the Second Harvest Heartland warehouse in Maplewood, Eli was amazed by the large amounts of food and told us, "I wish for a refrigerator full of macaroni and cheese!" This hunger-fighter even said he wanted to work at Second Harvest Heartland when he grows up. We are thankful for support that comes in all sizes. Eli and his family are a shining example of how you can make an impact on hunger at any age. Thank you Eli for the generous support!